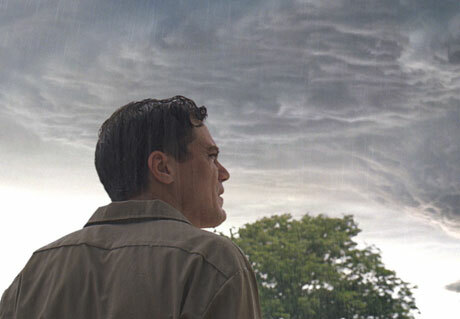 Since most films about mental illness depict their subject with awry spectacle, detailing difference as some sort of sideshow oddity to be pitied and exploited, Take Shelter comes across as an eerily profound and welcome breath of fresh air. It assesses the onset of Schizophrenia with a shrewd, inclusive eye, inviting us to empathize with, rather than raise an eyebrow at, a normal, reasonable man confronted with irrational desires and visions that he can't logically shake. Detailing the somewhat covetable, relatable and moderately autonomous blue-collar quotidian of breadwinner Curtis (Michael Shannon) and comely wife Samantha (Jessica Chastain), a stay-at-home mother, writer/director Jeff Nichols slowly builds a pleasantly reassuring vision of Americana, conscious of economic constraints, but making the most of community and family values. It's the sort of environment where difference stands out, which is why Curtis is so quick to keep his apocalyptic dreams and bedwetting to himself. As a common narrative convention of the psychological thriller, the question of illness versus prescience comes into play, with the possibility of the creepy onscreen visions holding precognitive clout. But rather than travel that road for cheap thrills and an inevitably convenient denouement, Nichols details the pains of someone coming to terms with paranoid schizophrenia, hiding his symptoms from his wife and friends while quietly seeking counselling and researching psychology. The possibility that a storm is coming to end the world never drops out of the narrative entirely, leaving a sense of foreboding mystery lingering over the many naturalistic and impressively performed sequences of familial distress. But while it's there, it never damages what is ostensibly a deeply upsetting human drama about a family put in crisis by mental instability.